It’s a strange title for this article on Flame and Citron, the latest opus by one of Denmark’s leading filmmakers, Ole Christian Madsen. Even stranger are the two epigrams, it might seem, in relation to a noir thriller about two Danish Resistance fighters in World War II. But it’s my way of making sense of the magnetic pull Madsen’s new film has on me, the lightning speed at which it carries me through a world I am newly discovering, all the while I’m dragging my heels for time to cry. 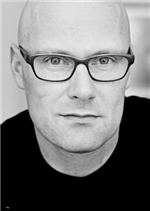 In the last decade Madsen has developed a unique voice that bridges two very distinct modes of filmmaking: on the one hand, an improvisational technique linked closely to the Dogme movement of independent filmmaking, and on the other hand, a large-scale mode of production responding to the genre codes of classical cinema and television. How could a writer-director so successful with the rigorous style of the gangster genre (The Spider for Danish TV, 2000) and the meticulous formal detail of an epic period piece (Flame and Citron, 2008) manage to move me with the same melt-down moments I’d endured in his intimate domestic dramas, Kira’s Reason: A Love Story (2001) and Prague (2006)? Kira’s Reason will always remind me of John Cassavetes’ A Woman Under the Influence, even though Cassavetes’ film, maybe the “wilder” of the two, was not improvisational at all, and Madsen’s is based quite decidedly on this approach. Regarding their overlapping subject matter, with Cassavetes’ disarming storytelling via his dynamic hand-held camera, his location shooting, and Gena Rowlands’ performance, I’d never been so surprised before, but Madsen managed to turn my head all over again when I first saw Kira’s Reason in Europe the season it opened. All the universe was “on edge,” in another “light,” “heavy with love” — and I was “transformed.” For all the rigid ten commandments of the Dogme school laid down to capture reality (the film gained the certificate Dogme #21), what caught me was that reality in all its subjective ambiguity — a mind coming apart, two hearts unhinged by the mysteries of life. To achieve this truth, Madsen wrote the feature-length script with only 70 scenes but shot 120 hours of footage, opening each scene with improvisations and gaining intensity from there. In the delirium of the film before my eyes, I was right there with Kira (Stine Stengade), just home from the hospital, off-kilter in the public swimming pool with my children, dead-sure of the affair between my husband (Lars Mikkelsen) and my sister, all-knowing that my forgiveness was the only way he might manage to forgive and accept me. As Kira loses touch with her life, she and Mads fight for their love, and through their losing battle, we grow closer to them yet further from any clear answer to their dilemma. What we gain is a gratifying sense of trust — in the filmmaker’s bravery of intuition that matches and meshes with the characters’ elusive persistence. Prague seems to present a clearer futility, at least for the marriage at hand; yet in this Kafkaesque tale of an absurd mismatch between characters and place — bourgeois Danes among working-class Czechs — the result is perhaps less unsettling even if nothing remains the same. 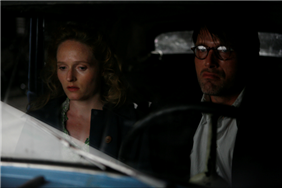 The husband and wife here are Stine Stengade, once again, and now Mads Mikkelsen (real-life brother of Lars); they are once again coming apart at the seams, this time owing to the husband’s lack of affective expression and the wife’s restless distraction for someone else. A visually stunning film shot on location in the labyrinthine alleys and cozy bars of a city of historical charm, Prague plays with the soulfulness of a culture mythically drenched in it own incongruities but also in generosity, humility, and empathy — the so-called “big emotions” that neither Christoffer, the husband, nor his deceased father, whom he has come to take home, have been able to show. Yet the dead man is a living legend of love, something Christoffer is as shocked to discover as he is aspiring to achieve. “Like father, like son” — the idea scares him, yet it is exactly what Christoffer needs. The language barriers, bizarre detours for the coffin, repeated adages, default encounters on the cobblestone streets — translated into lonely empty frames, tilted angles, double and reversed images, and a 360-degree camera pan — turn out to be a life-saving opportunity for husband and wife, even with the death of their marriage. Neither the stringent Dogme film nor the sweeping epic, Prague is a step in-between, using the atmosphere and mood created via a hand-held 35mm camera to explore character and feeling. That same cinematographer (Jørgen Johansson) and editor (Søren B. Ebbe) who worked with Ole Christian Madsen on Kira’s Reason and Prague have yet again made outstanding contributions to Flame and Citron. 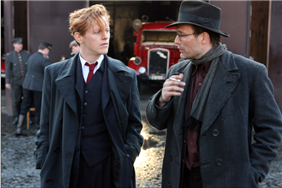 Madsen recently explained to me the similarities and the differences for him, both in goals and methods, in the ways he worked with his crew on his new film vis-à-vis their earlier work. DS How did you conceive of the role of love in the lives of Bent Faurschou-Hviid and Jørgen Haagen Schmith (nicknamed “Flame” and “Citron”), two “illegals” of the war — undercover agents of sabotage and assassination who were “wanted” like gangsters by the Germans? OCM In a period piece, such as this one in which the characters and story, sets and costumes leave sixty years between the contemporary audience and the film, it’s hard to really come across, it’s so far away. What I decided to do with Flame and Citron is that every time there was a period scene I tried to follow it with a love scene, for example Citron (Mads Mikkelsen) with his wife (Mille Hoffmeyer Lehfeldt) or Flame (Thure Lindhardt) with Ketty (Stine Stengade). I wanted to integrate what I knew about chamber pieces with the very big shooting scale in this film. My film is a look into the hearts of two men who decide to take lives, to become killers… It deals with the aesthetics and the anatomy of the kill, the price you pay when you cross the thin red line, when you lose your humanity to a bigger course. What does it take to pull the trigger on an unarmed opponent? How much love can there be in a freedom fighter’s life, without there being too much? This is something I wanted to explore. DS What about the relation between Flame and Citron? Is it love? Is it their shared clash of political convictions with moral ambiguities? Or perhaps, in the end, is it just one of mutual trust? DS How much liberty did you take with the story? Is the newsreel footage authentic? OCM All that is in the film really happened, but I left things out and presented them in a different order to be able to say what I had to say. 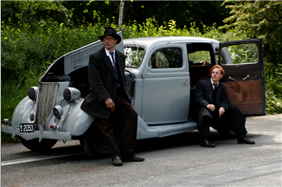 (For example, in the scene where Flame and Citron think they’re shooting the Gestapo, the car held a man and two sons, not one — I chose to omit one of them.) The old-looking, grainy, black-and-white sequences edited into my film are real historical footage from those years in Denmark. DS Was the film shot at the real locations? OCM In terms of the image, we shot in Copenhagen but I couldn’t re-make the Copenhagen of 1944, because that’s gone now. 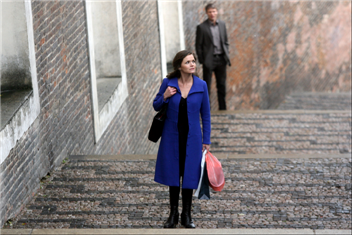 Scenes that take place on the actual streets were shot there, with some icons in the background, but I aimed for the setting to be any city in northern Europe. I also stripped away what many people imagine — lots of Nazi symbols all over the streets. I wanted to give the film a more real, daily-life feeling — what the city looked like during five years of occupation, of people living from day-to-day without food, clothes, and so on. Some exteriors were shot in Prague and some interiors were shot in Berlin, such as Ketty’s hotel and the house where Flame stays. 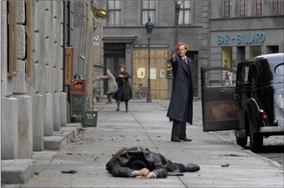 Financing took us to both these places; Babelsburg Studios in Berlin put up a lot of money for the film production. 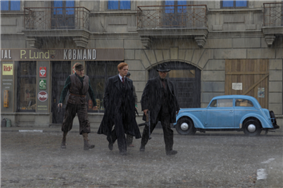 DS Your film strikes me as quite different in tone from Jean-Pierre Melville’s Army of Shadows, which is shot very expressionistically and makes very clear heroes of the Resistance fighters in France. Flame and Citron have multiple faces: patriots, terrorists, existentialists. OCM It was half a year before I started Flame and Citron that I saw Army of Shadows, the best film I’d ever seen on the Resistance. It really points out what an occupied country is. I wanted to build my film only on rituals — how to assassinate, how to shoot guns… only two guys moving around in their special way, because these characters are huge. They’re not real people who happen to find themselves in extreme situations; they’re not normal — they’re extraordinary people in extraordinary situations. Rather than being a romantic statement about the war, my film tells about the complexity of being part of the war. Everybody has their own reasons to fight or to surrender. Flame and Citron is a drama evolving from the eye-level of the two title characters to a broader angle dealing with the issue of who is using who. DS Who was Ketty, really? A fashion photographer? A courier for the Resistance? A double agent? OCM Ketty, who betrays Flame in the end, had affairs with the Gestapo, with Winther, with other Resistance fighters, as well as with women (she was bi-sexual). She operated as a Russian spy at the same time. She was brought up very poor in Copenhagen and became a “dancer” — in those days it was the term used for “stripper” — at the age of eighteen. She was a very active sexual woman. Flame, a red-head, coming from a German-friendly family, is very introverted, polite, knows all about wine and food. I had decided that the overall shape of Flame and Citron should be film noir. DS Is Ketty a classical femme fatale? OCM Eight to nine years ago I made The Spider in a very strict form, about a black market family in Copenhagen in 1948; it was a wide-angle frame, dark, expressionistic. After that I did Kira’s Reason and Prague, with a hand-held camera, an easy-going and subtle style. I wanted to combine both approaches for Flame and Citron. We dug up Ketty Selmer when we researched the film. She’d been there — people knew of her — but they didn’t suspect her at all. They had no idea of who she was. And she acted as she did toward Flame, I think, because she was under pressure. She was afraid of dying, because she was “between chairs,” as we say. She was way out of her league. DS How much do Danes today know about the Holger Danske group and the Resistance during World War II? OCM Flame and Citron themselves disappeared from Danish history right after the war. They did win the Medal of Freedom from the U.S. Congress and Flame was presented with the Montgomery Medal, but they didn’t really fit in with the usual story of the war and Denmark’s resistance ever since the war began. Danes never stopped resisting, mostly because Denmark had Nazis from the beginning. But Denmark was “saved by the bell,” so to speak, in two ways: first, by the escape of the Jews before 1943 — they were able to leave Denmark before they were sent to concentration camps; and second, by 1,500 Resistance fighters, 850 of whom were shot by the Gestapo. Since the war there has been a re-writing of history in Denmark: the official tally in books is 50,000 Resistance fighters. This distortion served mostly to get the help from the Allies and through the Marshall Plan. * Ole Christian Madsen to this author in: Diane Sippl, “The Intimate Screen: Dogme and Beyond,” CineAction magazine, No. 57, 2002. Director: Ole Christian Madsen; Producer: Lars Bredo Rahbeck; Screenplay: Lars K. Andersen, Ole Christian Madsen; Cinematographer: Jørgen Johansson; Editor: Søren B. Ebbe; Production Designer: Jette Lehman; Composer: Karsten Fundal; Costume Designer: Manon Rasmussen; Sound Designer: Hans Møller. Cast: Thure Lindhardt, Mads Mikkelsen, Stine Stengade, Peter Mygind, Mille Hoffmeyer Lehfeldt, Christian Berkel, Hanns Zischler, Claus Riis Østergaard, Lars Mikkelsen, Flemming Enevold, Jesper Christensen. Color, 35mm, 130 minutes. In Danish with English subtitles.